We help companies to comply with the legal health and safety obligations by providing various courses, including ERO Emergency Response Officer and Safety & Health Officer. Click on a green button below to see our lesson dates and prizes on the NedCert website and to sign up. Every company with personnel in the Netherlands, for example an office, must arrange a company emergency response team (Bedrijfshulpverlening, BHV) so in the event of emergencies, employees and visitors are properly cared for. Experience a special day and step into another world, which can become reality on your own work floor. Classes are taught by a NedCert certified instructor who provide compact, no-nonsense ERO courses in a modern way, with lots of practical exercises. By applying a balanced mix of learning styles, the ERO course is, from the beginning to the end, fun, informative and engaging. We work with small groups, so we are able to give a lot of personal attention. 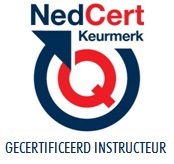 The examination is conducted by NedCert Certification according to ISO 17024. If someone succeeds, he receives a certificate Emergency Response Officer (BHV). The certificate is valid for 2 years. The price of the ERO course includes the textbook and the use of emergency response training materials, bandages, AED’s, extinguishers, free tea/coffee, free lunch and examination fees. This training day also is suitable as a refresher or when someone has done a BHV course before at another organisation. Giuseppe Settimio van Saipem Finance International B.V. Thank you for our training! I enjoyed learning these new safety skills during that day. Thanks for your clear answers and fro the good atmosphere. Baptiste Le Texier van Hitachi-LG Data Storage, Inc. I had a great day with Rene learning how to help people in the office and learning what to do in case of a fire. I hope that I do not have to put these things into practice but I now believe that I will know what to do if I have to do that. Sarah Barones Sweerts de Landas Wyborgh van Bunq B.V.
Great day of training. I learnt a lot about safety and the best reflexes to do. Dorian Amouroux van Impraise B.V.